A very handsome antique reclaimed Gothic style oak front door with frame. The door has a wonderful style, ideal for a period cottage or Arts and Crafts style house. The door has an arched top, in the Gothic style, traditional iron studs, Gothic iron straps that are supplied with the door and letter box in the same Gothic style. The frame is thick and chunky and has arched detailing to accommodate the door and a carved design. The oak is stripped to bare wood and is ready for purchaser to finish with an exterior wax, oil or paint. The door is made using oak planks and has three thick ledges on the internal face. The door is a reclaimed antique and therefore has some slight signs of wear due to age. There are some marks and holes where the door hardware has been removed and some filler is present in areas. The frame base has some small splits and surface cracks. The door and frame have some small knocks, chips and splinters. Some slight colour variation in the wood can be seen, please see pictures for details. The door and frame are very finely made and have a great deal of style and character. 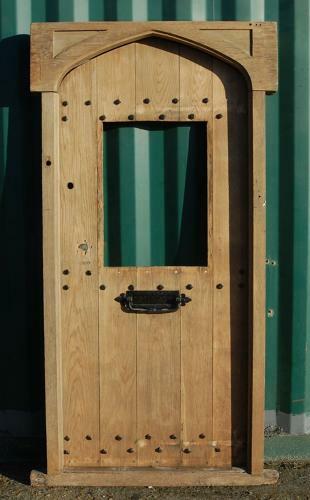 Ideal for giving period style to a home, the door is a fantastic reclaimed item.